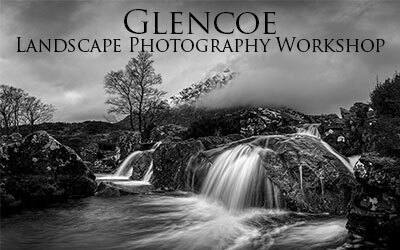 Landscape Photography Workshop – Glencoe in the Highlands of Scotland is up there as one of the top 5 places to photograph stunning landscapes in the world. It has everything a photographer could ever dream of. Stunning mountain ranges. Cascading mountain waterfalls. Wildlife is more beautiful than you could ever imagine. Wild Deer and huge Stags that are totally comfortable in the presence of humans. Some will even eat treats out of your hands. Jaw-droppingly beautiful and so fantastic for pictures. There are stunning landscapes to be had and most of them require very little effort from you! Some of the best locations are literally a stone's throw away from the side of the road This makes Glencoe easily accessible to just about everyone, old or young, fit or unfit! Obviously, I will encourage everyone to venture much further away from the easily accessible locations but this will be up to you! I guarantee you’ll return home with photographs you’ll want to print and cherish forever.